Aussies lead the world in coffee-making. Our baristas are world class. 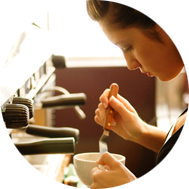 Sign up for a barista course and learn how to use a coffee machine today! We have new commercial machines for students to learn on. 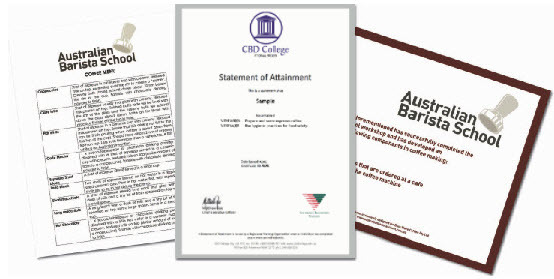 Our 5 hour barista course results in a nationally recognised Statement of Attainment bearing the units of competency SITHFAB005 Prepare and serve espresso coffee and SITXFSA001 Use hygienic practices for food safety (issued by CBD College, RTO# 91399). This course can be completed in one day or split over separate days (3 hours one day, 2 hours on another). We can provide advice on barista jobs in the industry to help you get started once you have completed your coffee training with us. 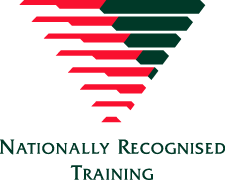 Students will be assessed by trainers with the relevant qualifications as set down by the Australian Government. This assessment will take the form of direct observation of practical tasks and written questioning which will take place through online learning which students must compelte prior to attending class. To book for other cities click here: Brisbane, Sydney, Newcastle. Select dates below. First select your ABS 3 hr date and then you will be prompted on the next page to select your 2hr Coffee Art date.